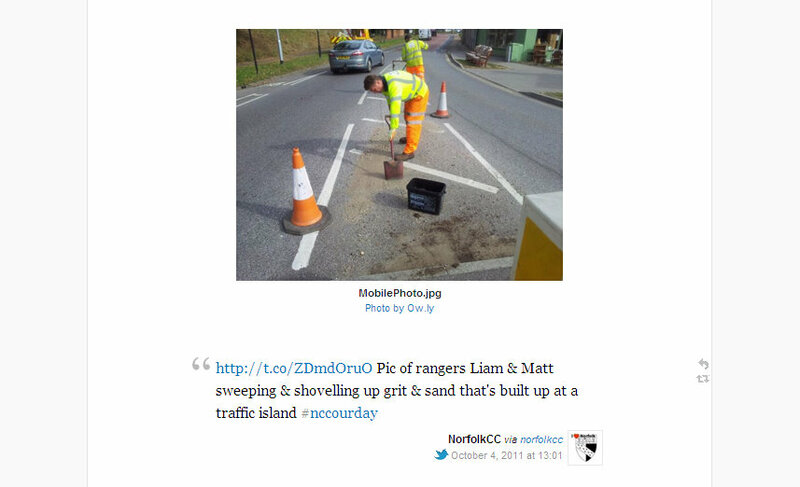 I’m a media officer at Norfolk County Council and on Tuesday, 4 October we tweeted the working days of five very different frontline service areas under the hashtag #nccourday. We took our lead from Walsall Council and other public sector tweeting pioneers and sought to increase understanding and make people feel closer to the council and its services. But we also wanted to do something a little different to what had gone before, initially because we knew we stood to get more attention for the project this way. We decided to focus on trying to convey a day in the life of five specific teams or individuals who work for the council, all in one day, ‘Our Day’. We felt this would give a human and engaging feel to the organisation and our tweets while also demonstrating the breadth of work we do and the different ways our employees support and serve the people of Norfolk. Five seemed like a good number too – manageable to resource but still giving us enough scope to show how multi-faceted the council is. So on that Tuesday, I was out in mid-Norfolk shadowing and tweeting about the working day of two of our highway rangers while some of my colleagues followed an adult social worker, a shift of fire-fighters, our biggest library and our customer service team. I’d say this approach worked better than we could have imagined, in ways that we didn’t really consider when we decided on it, and I’ll explain why in a short while. First, so you can judge for yourself, we’ve preserved the #nccourday tweets on Storify, have a look here (and you’ll make us very happy! ), you’ll find each of the five strands that we ran on Our Day separated out into individual stories. We’ve included some of the retweets, comments and questions we got – and ‘Storifying’ the tweets has made me realise just how much interaction and support we got. I think our ambition to give the council a human face, or more accurately several different human faces, really worked. We used first names of our staff where appropriate and because my colleagues and I were tweeting as observers it had the feel of being fly-on-the-wall, helped by the fact that we, the tweeters, were ‘visible’ as narrators – we thought it was important to make it clear whose perspective was being tweeted and this meant we could react and comment ourselves. We also supplemented the ‘official’ tweets with ones from our personal accounts, still using the hashtag, and this was adopted by some other staff who were involved in or aware of the event. You can see from Storify that we received a lot of warmth in the feedback, and we were surprised to get no negative feedback about #nccourday on Twitter whatsoever, and I think this was in no small part due to the obvious human touch that ran through it. 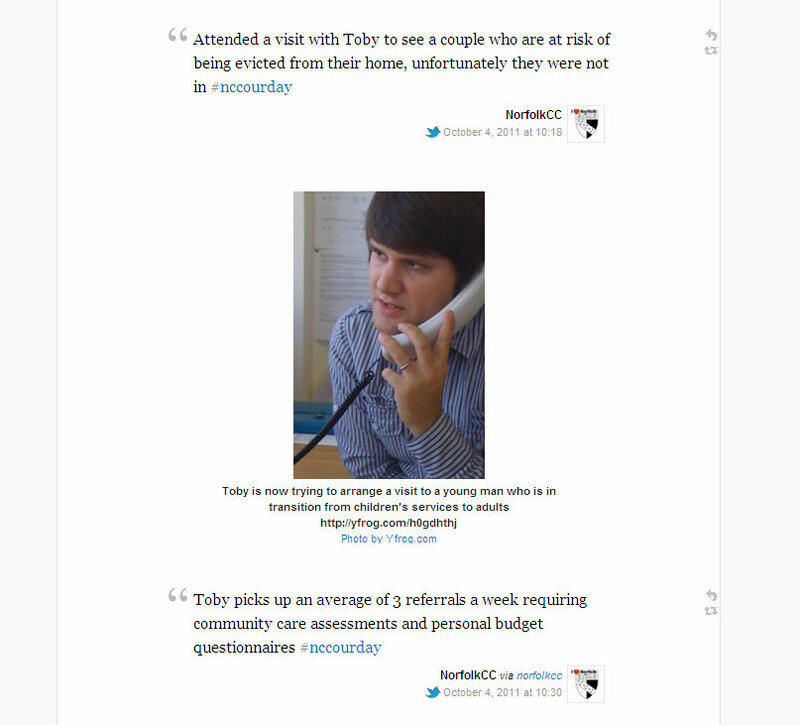 It was also great to run the event across three well-established Norfolk County Council Twitter accounts. 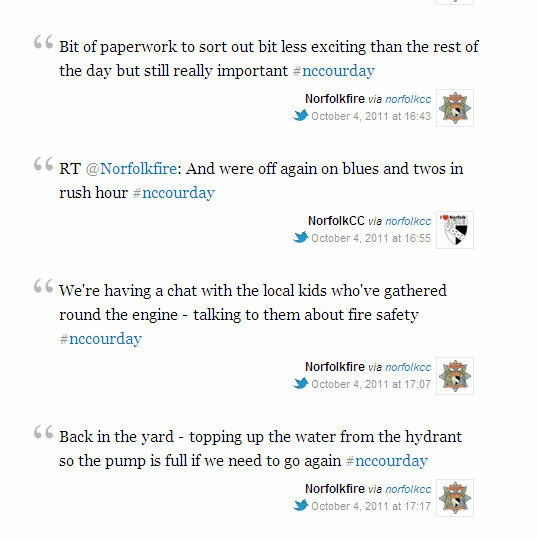 @Norfolkfire tweeted the fire-fighters, @NorfolkLibs tweeted the library and @NorfolkCC tweeted the rest. This meant we could reach more people and reduce the potential for confusion and the risk of clogging up people’s feeds from one account. It also meant that members of the communications team, where I work, got the chance to work closely with those people in the fire service and library service who are responsible for their social media work, and it was brilliant to share our knowledge and work together, it’s knitted us together where before, although supportive of each other, we were pretty disparate. We’re already talking about other ways we can continue to link up and hopefully get other partners involved too – and on this note I think holding the event engendered increased goodwill towards us on Twitter from some of our peers in Norfolk too. One of the best outcomes of Our Day was the boost it seemed to give the staff we shadowed, and their wider teams. 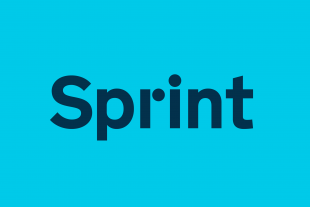 We chose the five service areas because they were ‘customer-facing’ and for the breadth they demonstrated as a whole, but also because each in their own way can be misunderstood and have a bit of an image problem. Without exception we found the teams were really pleased that their roles were considered interesting and important enough to be featured in the event. And it did the profile of the communications team and our work the world of good internally. By the end of my day with the highway rangers they were suggesting that I should come out on a gritter with them and do something similar again while in the customer service centre some of the team have expressed an interest in shadowing members of the communications team for a day too. It’s also worth mentioning that we got really good traditional media coverage locally for the event, which of course helped to prove its worth. We all think we probably could have got more coverage in fact but we were on a tight deadline because we wanted to run the event to coincide with Customer Service Week, for internal rather than external communications purposes, and really only had two weeks to plan the whole event from start to finish. But of course you can always do more and having to get on with it and not having the chance to second guess and doubt our approach too much was no bad thing in this instance. And this brings me to the final benefit – Our Day invigorated us! It made us believe that we can ‘do’ social media and not to be afraid of it. We had played it pretty safe up till that point and I would heartily recommend doing something along these lines if you think your council’s social media endeavours could do with a bit of a kick start. I think the success of the event, for all the reasons listed above, has given us confidence, will make us ‘think bigger’ in the future and potentially be bolder in our choices. Would we change anything if we had our time again? Well, not much. There were minor technical problems at stages but none were catastrophic, although perhaps we would have a clearer back-up plan in place next time. 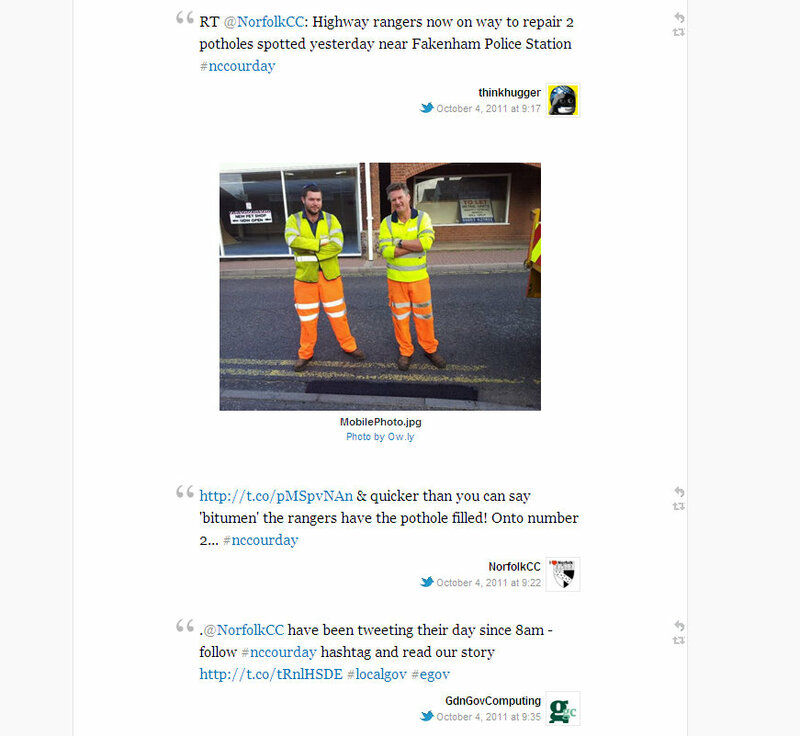 There were benefits and drawbacks to tweeting three strands from the @NorfolkCC account, and at times it was probably a bit confusing to follow (this feedback from within the communications team rather than from a resident or on Twitter) so we might reconsider this approach if doing something as broad again, perhaps using more – and even personal – accounts. And it would be nice to think of a way to involve other members of staff in a future event. One employee tweeted us to congratulate us on Our Day and said he hoped he might be allowed to tweet his working day at some point – the challenge will be not letting Twitter interfere, or appear to interfere, with the important work done by our staff but it’s definitely something we’d bear in mind. I’ll leave you with some stats, if I may. In the week when Our Day happened the @NorfolkCC account gained about 100 followers, which is more than usual (my estimate would be 20-30 on an average week). The #nccourday hashtag was used more than 550 times, with fewer than half of these coming from the three official accounts. If you want to get in touch, feel free to direct message me @SusieinNorfolk if you have any queries or comments, or ‘me and others’ on the @NorfolkCC account. Nice, this has given me some good ideas for my own uses of Twitter 🙂 I've also followed @norfolkcc’s.